The Philadelphia letter already contains several promises of Christ to this faithful church. It closes with his promises to the conquerors. Jesus says, “The one who conquers, I will make him a pillar in the temple of my God and he will certainly not go out of it anymore and I will write on him the name of my God and the name of the city of my God, the New Jerusalem, which comes down out of heaven from my God, and my new name” (3:12). Except for the promise of Jesus’ new name, all of Christ’s promises to his conquerors here are blessings that any of the church’s Jewish persecutors would desire to receive. The first promise requires some interpretation in light of the Old Testament and the book of Revelation. According to the Psalms, the temple is the most desirable place for the child of God to dwell, because it is God’s special dwelling place on earth. Spending eternity in God’s temple is thus highly desirable, but Revelation says expressly that the New Jerusalem does not have a temple in it, for God and the Lamb are its temple (Rev. 21:22). 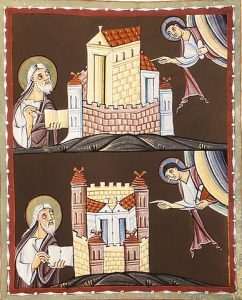 A closer reading shows, however, that the New Jerusalem is God’s temple and his holy city. It fulfills the role of both (21:16). Jesus promises the conquerors that they will be pillars in the New Jerusalem, the final temple of God. The pillar image communicates the permanence of their place in God’s city, as does the statement that they will not go out of it. The next three aspects of Jesus’ promise in Revelation 3:12 all have to do with writing names on the people of God. First, “the name of my God” will be written upon them, which agrees with statements elsewhere about the name of God on their foreheads (14:1; 22:4). Second, they will have the name of God’s city, the New Jerusalem (Rev. 21:2, 10). Finally, they will have the “new name” of Jesus himself. This is probably the same new name that Jesus mentions in Revelation 2:17. Since the Philadelphia church did not deny his name (3:8), they are promised the privilege of bearing his new name, when it is revealed in the New Jerusalem. Having these names written upon them means that they belong to God, to the New Jerusalem, and to the Lamb. They are his people and are eternally bearers of his name. Paul Hoskins, The Book of Revelation: A Theological and Exegetical Commentary, pp. 110-11 (those pages provides further sources and footnotes that I have omitted above).